I hate to admit it, but some of the best salsa I’ve ever made has come from canned tomatoes. Now that I’ve been making my salsa this way for a while I’m pretty much convinced that this is the same method that my favorite Mexican restaurants use to make their salsa as well. Oh, and the best part: no endless chopping, the blender does most of the work for you, allowing you to have nearly a quart of salsa ready in about a minute. 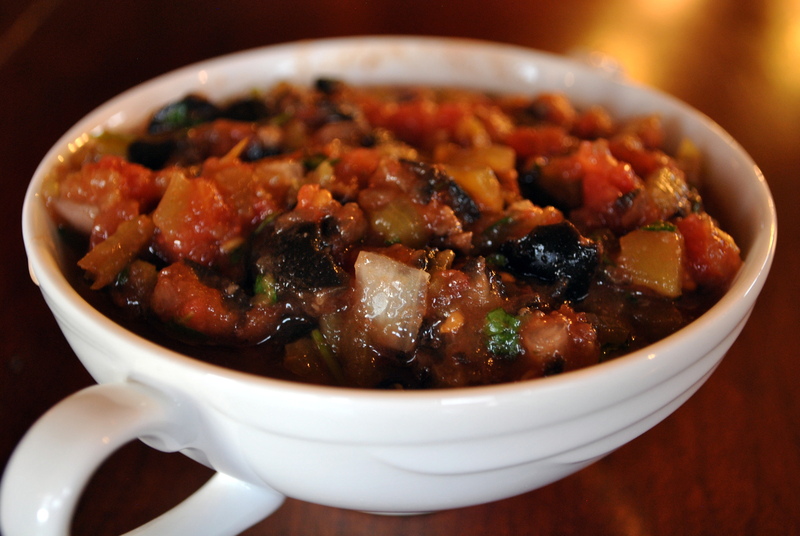 1 can diced tomatoes, 1 can drained black olives, 1 small can diced green chiles, 1/4 of an onion roughly chopped, 1/2 bunch cilantro roughly chopped, 2 T. fresh or bottled lemon juice, garlic salt to taste, few grinds black pepper, squirt (or 4) of sriracha or other favorite hot sauce. Dump all ingredients in your blender. Pulse a few times until chopped to bits and everything is well combined. You’re done! We like to eat ours with baked tortilla chips. You can also make this without the olives if you prefer. 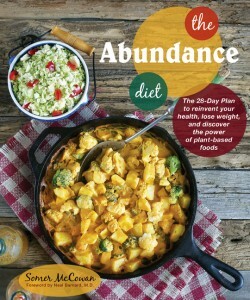 Have you joined the Virtual Vegan Potluck yet? What are you waiting for? The Party will be on November 1st, World Vegan Day. Thanks Lucy! The olives were an afterthought, but oh so yummy! Never made salsa with canned tomatoes, but I think you are spot-on about some Mexican joints making theirs that way. I’m tryin’ it cuz those photos look so good!! Bring on the chips! I hadn’t done it until this year. Converted (shame on me)! I’ll swear it’s delicious. I used to chop for hours making the fresh variety (why does fresh salsa turn all soapy and frothy if you try to process or blend it?). I needed salsa one night for a meal and didn’t have fresh tomatoes or jalapenos on hand so the original recipe was created out of desperation. It tastes just like fabulous Mexican restaurant salsa. The other thing about fresh salsa is it does get very soupy. And yeah, the froth is kinda icky. This is another recipe for the weekend. I’ve got a pot of rice and beans that are crying out for this stuff. Yay!! I think I’m good for next week, too – thanks in part to our dual post ;-)! And then – – only one more week of crazy MoFo! I know! 🙂 🙂 Is the month really over that quickly? I’m so not ready for holiday season yet! Nice! Dude, I miss your guts. I feel bad this weekend didn’t work out. Mmmmm, yummy! I love cilantro AND for me, the more lime juice (lemons or limes, I just go with what I’ve got at the time) the better! What did we ever do before Sriracha sauce??!! I’ll bet this would be good over some butternut squash & black bean baked enchiladas….with gluten-free sprouted corn tortillas…mmmm, come on, you know you want some! I know right?!? For me, it’s not salsa without lemon or lime and cilantro. Sriracha goes into more things than I care to admit around here, what dish couldn’t use a kicked up notch of awesomeness? 🙂 I totally want the butternut squash and black bean enchiladas in corn tortillas! Where’s your food blog?!? I’ll have you know (you’d be proud of me) that I served these on whole grain quesadillas with chopped spring onion, fresh tomato, red and green bell pepper and -wait for it- homemade Smoked Coconut Gouda (recipe coming soon) it’ll blow you away! I love canned tomatoes – for one my husband will eat them (he doesn’t like the texture of raw ones) but also they go in so many things. I buy petite diced organic ones. And they rock in salsa! That’s the same ones I used, and sometimes, if I’m feeling fancy I get the fire roasted variety! I love tomatoes in all their forms, which is why I was hesitant to post this recipe, but it’s too amazing not to share. I’ll take two for the road! It was a last minute magical whim, it takes this salsa to a whole new level of awesome 😉 ! p.s. I had some typos I had to correct in my cookie recipe last week. I hope it didn’t turn out too terribly for you, dang MOFO is wearing me out and ruining my ability to do coherent posts. Ah good. One other comment described them as stinky and gooey. Not words I’d use even without the corrections, but hey, you win some and lose some 😉 Thanks Emmy! Sriracha and olives…two of my favorite things! Can we be BFF’s? xoxo! It just hit me that I didn’t make salsa this year. I must’ve been in a tomato delirium to forget..I love the addition of olives and will have to try it out soon. Everything you make looks yummy! Oh NO! The attack of the killer tomatoes won!!! Well, if you bottled tomatoes plain you can use them for this instant blender salsa. Thanks Heidi! I am a sucker for salsa. I could drink it. I am VERY excited to give this a go as I have largely been disappointed with my own fresh tomato based efforts. Wonder what that’s all about. My salsa lovin’ son will be glad someone nudged me to give it another go. Thanks! You caught me, I sometimes drink it from the jar. Salty delicious goodness! I love fresh tomato salsa as well, but since I don’t have a garden and no-one was sending me their offerings over the summer, I found this baby. I must say I like it every bit as much as my successful fresh salsa efforts. The not chopping bit is fantastic as well! Love salsa, love olives, love this!! Looks divine! oooh i ‘d like to dig into this bowlful! You crazy, girl! And I mean “crazy” as in “crazy genius”! I like to make my salsa with sriracha already, but I never would’ve thought to add olives. Love it! I love it when I get links like these! Much appreciated. I just commented on your blog 😉 That chili looks pretty fantastic! thanks for the ‘like’ today, my husband is the salsa maker and I featured his recipe on my blog and we have discovered, like you, the canned tomatoes make the best, seriously, after using great fresh ones. Isn’t it crazy? Who knew? No more endless chopping in this house! Made this today: Never buying salsa again. Cha Cha Cha! 😉 Ole! Yummy! Bless you – just the kind of time saver I love ; ) And I confess I didn’t know what Sriracha was… a regional hot sauce thang perhaps? Yay! Oh, it is a FABULOUS HOT SAUCE. Pretty easy to find. Just look in the Asian section of your grocery store. It has a rooster on the bottle. You will fall in love with it. A little goes a long way, it’s HOT HOT HOT and delicious! I’ve never tried olives in my salsa – nice touch. Will have to give that a try. The good news is worms don’t bite, and they are kind of cute in their own way. Salsa is our *favorite* condiment! The Dirty Hippie makes a large batch and it takes all day – his process is so long, we’ve never bothered to blog it. Who has all day to make salsa, right? This looks much more practical! Can’t wait to try it. I’ve seriously spent all afternoon making fresh salsa before. It’s good, but I can honestly say this method produces better and quicker results! Yay for salsa in a minute! 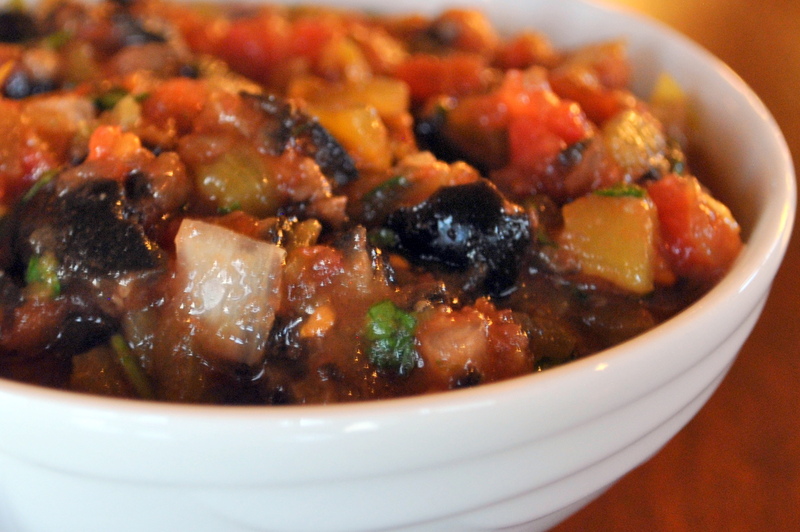 LOVE black olives in my salsa – there is nothing quite like homemade salsa! I think I might give our coming summer a food theme…I think it might be Mexican. I figure we can both scarf our weights worth of Mexican delights and slather it all in all kinds of salsas. Mexico = hot…Tasmania in the summer = hot…I am starting to see a pattern emerging here! Off to write “Sriracha” on the shopping list! Nice pattern! Sriracha is awesome! Try as I may, I’ve never been able to get onto olives. This recipe might just be the fix! Haha, if not, it’s really delicious without too. 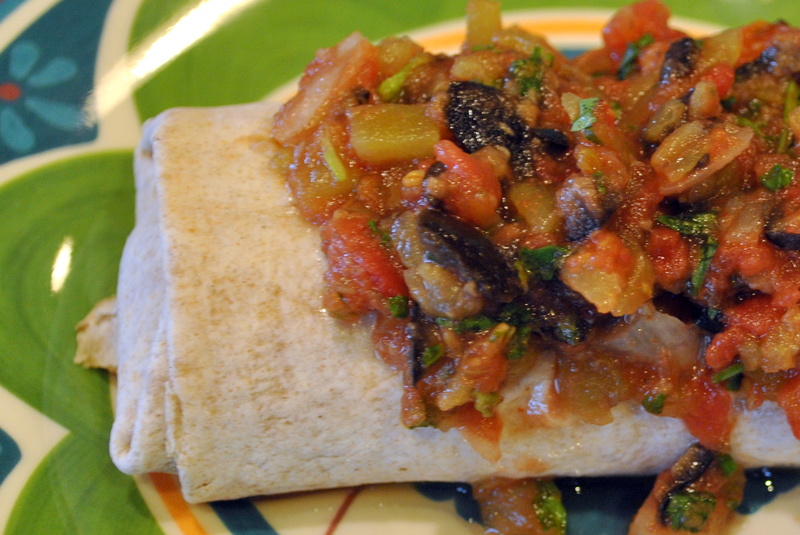 You may never go back to store bought salsa!